After Marquez Valdes-Scantlingblew up as a highly owned value play, DraftKings responded with the tightest pricing to date. This week, Gurley finally broke the 10k barrier and a slew of stars play on the primetime slates. With that said, here are a few value plays that should provide an edge on the DraftKings main slate this weekend. Fresh off a bye, Jameis Winston will start against an injury ravaged Falcons defense, in the second-highest game total of the week (57.5). Atlanta has allowed the 4th most fantasy points to quarterbacks this season, with Keanu Neal, Ricardo Allen, and Deion Jones out for the season. Playing as 3.5-point underdogs with no run game to speak of, Tampa Bay projects to throw quite a bit. Lock Winston into cash lineups as the 7th most expensive quarterback. Despite a monstrous 110 yards and 2 touchdowns in Week 5, James Conner rose only $200 in salary. Conner has handed 90.6 percent of the Steelers running back touches (2nd most in the NFL), along with 28 targets. Cincinnati has allowed the 8th most rushing (502) and receiving (287) yards to running backs this season. Game script independent, Conner should anchor cash lineups. Until we receive updated injury news, T.J. Yeldon looks like the best value on the slate. Leonard Fournette and Corey Grant will both miss this game, locking Yeldon into a feature back role. Yeldon recorded 93 percent of the Jags snaps last week and saw 10 targets. Dallas has played middling run defense to start the year, but Yeldon's volume cannot be ignored. He should be mixed into GPPs and considered in cash until updated injury information becomes available. Julio Jones ranks 3rd in receiving yards (564), T-5th in targets (55), and 3rd in air yards (871). However, Jones remains without a touchdown. An ideal buy low candidate, Jones draws a horrendous Buccaneers defense. The Bucs have allowed six 100-yard receiving outings in four games. Julio should be considered in cash and GPPs alike in this solid match-up. Quietly, John Brown has 44 targets and a league leading 871 air yards this season. Quickly becoming the Ravens top receiver, Brown draws a winnable match-up against the Titans. On the outside, Titans corner Malcolm Butler has struggled, allowing 23 catches, 405 yards, and 4 scores in his coverage. Brown projects to see a good deal of Butler this weekend and looks like a solid value play in cash this week. When looking at bargain bin receivers, look no further than rookie Keke Coutee. In two games, Coutee played on 93 and 71 percent of the Texans snaps, recording 22 targets. Facing a solid Bills pass defense, Coutee projects to play a majority of his snaps in the slot and away from the Bills standout boundary coverage. The rookie makes sense as a salary saving option across game types in Week 6. It looks like another rough week for tight ends, with Rob Gronkowski, Travis Kelce, Jimmy Graham, and Zach Ertz off the main slate. However, C.J. Uzomah appears to be a diamond in the rough at 3k. 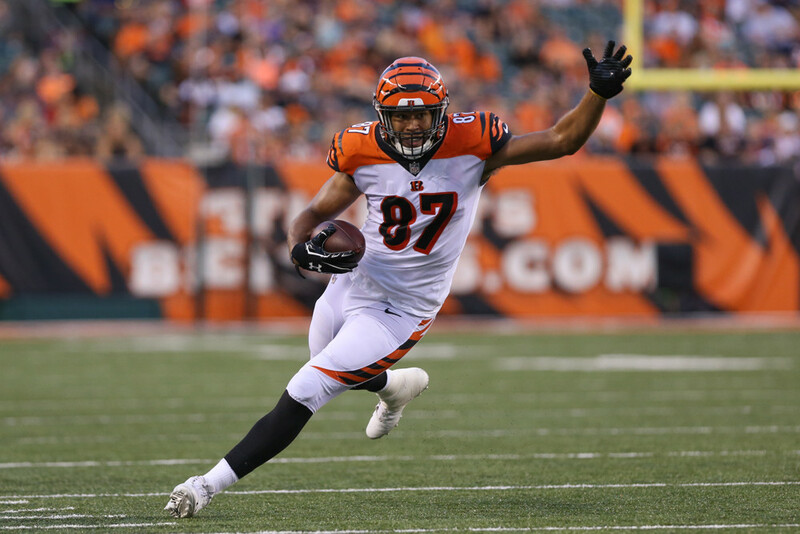 Without Tyler Eifert and Tyler Kroft, Uzomah played 92 percent of the Bengals snaps last week. Pittsburgh has allowed the second-most yards (424) to tight ends this season. This play will take courage, but Uzomah makes sense in GPPs on a tight week.